This new water park provides both excitement and respite from the heat with its Thai-village themed rides. A lot of effort has gone into the look of the place and the rides are numerous and world-class. Lazily float down the Mai-Thai river or take the challenge of the Tower of Power with has a 28-metre vertical drop. There is a big beach area and a wave pool and a special watery playground area for small children. The Floating Market, styled like a Thai village, has shops and restaurants and even offers spa treatments for those who would rather be pampered than thrilled by the rides and slides. There are some nice touches, like the sea lion enclosure, where you can watch the animals at play, and a shark tunnel and some rapids as an optional extra on the lazy river. The park is very popular and in the summer months the queues do get long. It is recommended that you book your tickets in advance online so that you can at least skip the entrance queue. There are things like lockers and sun loungers available for rent. A free bus runs from Los Cristianos, Las Americas and Costa Adeje. 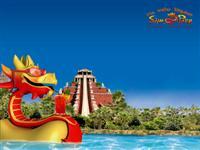 Siam Park should provide a fun day out for people of all ages and is especially good for entertaining teenagers. Address: Autopista TF1, Salida 28, Costa Adeje. Opening times: Open daily from 10am to 6pm (May to October); 10am to 5pm (November to April). Admission: €33 (adults); €22 (children aged 3 - 11).